STARFRIDAY : Kriti Sanon praises Tiger Shroff's MJ video. 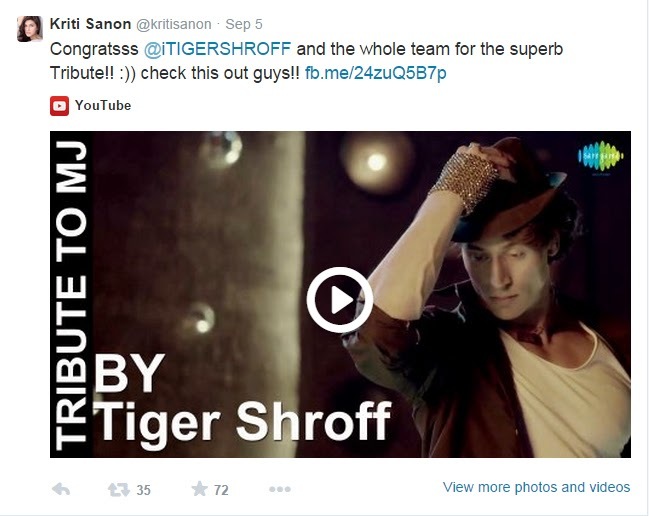 Kriti Sanon praises Tiger Shroff's MJ video. Kriti Sanon is all praises for her Heropanti co-star Tiger Shroff. After seeing Tiger Shroff's MJ tribute video, Kriti was in complete awe of his dance moves and immediately tweeted the same. She made a point to congratulate Tiger and the entire team behind the successful video. Kriti has been raving about Tigers dance moves and considers him to be one of the best dancers. She always looks up to him for suggestions on dance. Kriti and Tiger made their debut together with Sajid Nadiadwala's Heropanti, that rode high on success. Their pair was much appreciated by all. Both the actors rose to fame with their debut and are doing extremely well with their careers. Inspite of being busy with their upcoming projects, the two have managed to regularly keep in touch. Kriti Sanon is currently busy prepping for her next 'Singh is Bling' opposite Akshay Kumar for which she is learning different dance forms.Kriti also has Raj Nidimoru and Krishna DK's Farzi starring Shahid Kapoor. She will start shooting for the same post Singh is Bling.